Nowadays there is a task of automation of trajectory and rapid processes parameters measurements with subsequent immediate processing of measurement results, in particular, when testing the high-speed missile systems products. Measurement automation in this area contributes to significant improvements in the accuracy and speed of measurements. Thus, ZETLAB mobile complex allows to reduce the time of obtaining trajectory measurement results from several hours to dozens of minutes. Moreover, the kit ensures visualization of many critical parameters, such as display of object trajectory and highlighting of the landing coordinates on the map. The purpose of trajectory measurements is to determine the motion parameters of various objects: missiles, artillery shells, aircraft, including drones. The optical measuring tools integrated in the kit are often used for such measurements. Hereinafter, the various functionally complete parts of the kit will be referred to as a “segment”. It is obvious that the object tracking by means of video alone does not allow to accurately and quickly determine the coordinates and exact time of landing with further detonation, because subsequent processing is performed by an operator. For example, if a missile is controlled, the mutual analysis of times of landing and further detonation allows to determine the missile penetration depth. 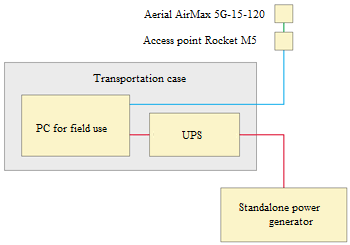 segment for determining the coordinates of object landing on a ground target and the exact time of contact according to seismic recording systems. In addition, the replacement of seismic recording system with acoustic recorders allows to handle cases with ground and air targets. For optical tracking of moving objects, this mobile trajectory measurement kit by ZETLAB applies two principles: high-speed video recording and high definition (HD) video recording. The matching and further processing of recorded video data is performed at the information collection and processing station. 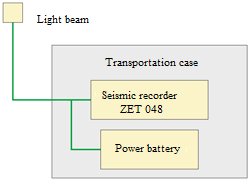 Recording of exact time, direction and location finding of the place of object landing or its contact with the target are performed according to readings of the seismic segment, which is based on the analysis of readings of several distributed seismic recording systems. The essence of the seismic segment operation is recording of a seismic wave, which occurs at the moment of object contact with the ground and, propagating in all directions, gradually affects various seismic sensors installed within the control area. Then the seismic recording system provides information to the data collection and processing station, which determines the exact time and coordinates with subsequent visualization on the pre-loaded map. determining the total firing-to-impact time of the object. 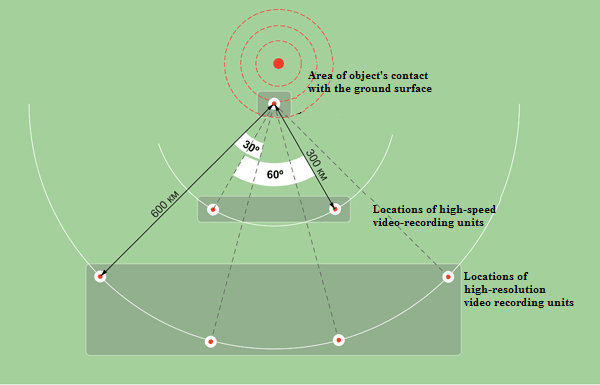 As follows from the short list of kit objectives, the actual technical specifications of the kit are critical: the angle of device rotation in azimuth and in elevation, the recording time of high-resolution camera and high-speed camera, the root-mean-square deviation of the video frames reference to the CMEA scale, the diagonal field of view of video recording device for lens in different ranges, the root-mean-square deviation of positioning at different altitudes (including super low, 50 m and lower), the root-mean-square deviation of the geodetic reference of video recording stations to the point of object contact with the ground. The hardware of ZETLAB mobile trajectory measurement kit consists of several shipping containers (one for each of the stations) and individually packaged masts, surveying tripods, and a free-running electric generator. The workflow of trajectory measurements is quite simple and implies a sequence of actions: kit deployment on site, video recording, video processing, and kit dismantlement. The kit deployment on site is implemented efficiently and quickly in a fairly short time, and includes installation of surveillance camera station (Figure 1), high-speed video recording stations (Figure 2), high definition video recording station (Figure 3). Once recorded, the information is efficiently processed and visualized at the information collection and processing stations (Figure 4). 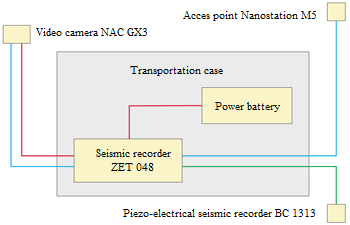 The video recording stage includes remote engagement of station and remote recording completion by the operator or automatically upon signal receipt from a seismic station (Figure 5). kit dismantlement by visiting station locations and packing the equipment into the corresponding containers (which usually takes hours) is easily completed due to compact hardware dimensions. The advantages of the kit include automation of measurements, rapid information acquisition for analysis, and measurement results visualization in a convenient form for the operator. Application of the kit significantly reduces labor and financial costs and improves the quality of measurements, which is achieved by using the minimum amount of hardware based on the ZETLAB commercially manufactured products. The kit composition is described in section Seismic Station and Seismic Receivers ⇒ Use Cases ⇒ Mobile Trajectory Measurement Kit.